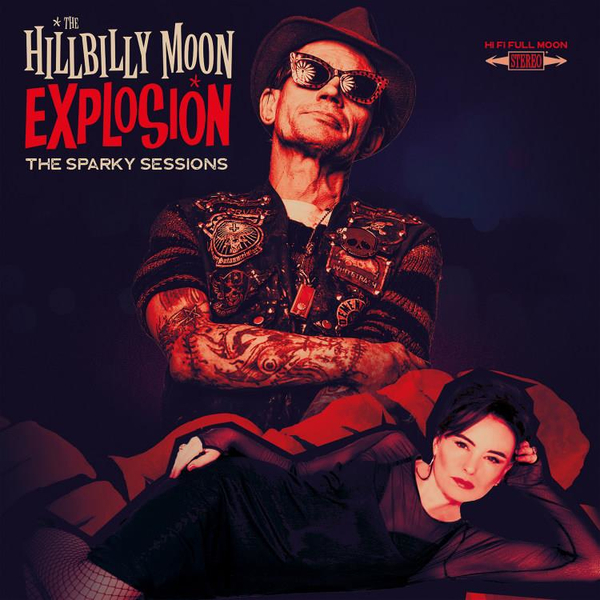 The Hillbilly Moon Explosion are a modern rock'n'roll band. With six albums under their belt, they tour the world with their authentic take on the roots of the wide genre of rock. They comprise two Englishmen abroad - Oliver Baroni, double bass & vocals, and Duncan James, guitar; a French drummer Sylvain Pettitte, and their captivating Italian/Swiss chanteuse, Emanuela Hutter. Building on their live gigs, in recent years they've become an online and vinyl phenomenon, with many tens of millions of Youtube viewers - in particular on distinctive duets with Sparky Phillips of psychobilly band Demented Are Go. Now an entire album of duets with the "Welsh Tom Waits" is issued, including 'Jackson' and the 'My Love For Evermore' vinyl and video hit. Seven new tracks are added to the previous Sparky collaborations. The Jackson 7" single is reissued to coincide, in an exclusive red sleeve in yellow slime vinyl.